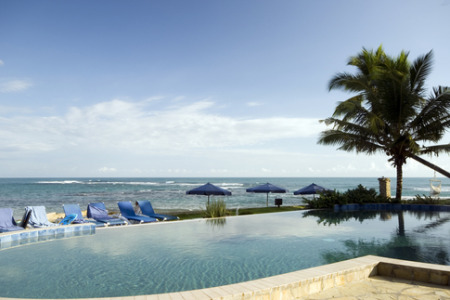 Cabarete holidays take you to the beautiful northern coast of the Dominican Republic. Imagine a tropical island with swathes of sun bleached sand, turquoise seas and swaying palms and this is your holiday destination. Holidays to Cabarete can be taken at any time of year as the average temperature is thirty. Although July and August are popular months it must be remembered that the hurricane season lasts from July to September. Holidays in Cabarete appeal to young adults and those with more than a passing interest in water sports. While the water here may be unsafe for children, the waves are ideal for the likes of surfing and sailing. The fertile waters, filled with multi-coloured marine life, offer great rewards for divers and snorkellers. There is also a golf course in the vicinity. We has a number of cheap Cabarete holidays that sports enthusiasts may find tempting. The standard of accommodation is very good so our low cost Cabarete holidays are considered great value. As expected, the nightlife here is very lively with dusk to dawn partying. Although shopping is limited, retailers supply all of your holiday essentials and restaurants cater for all tastes. If you are seeking a tropical paradise, check out our last minute Cabarete holidays and you could soon be living your dream. For further information and to view our best Cabarete holiday offers, please use the search facility.